I did some searching of boating forums and found a lot of praise for the way Interlux Perfection rolled and tipped. Perfection is a two-part polyurethane paint, and I wanted a two part because of its documented ability to stand up over years of exposure to sun and weather. I found Perfection available at Jamestown Distributors. Jamestown has done a fantastic job of posting advice and videos showing how to use Perfection to get a professional looking paint job by rolling and tipping. The sailboat is an early ’80s Evelyn 26. The boat has a nice hull shape and I wanted to show off the lines with a dramatic navy blue. I feel that a sailboat really doesn’t need an automotive level prep because, unlike the hood of a car people won’t be looking across the surface of the paint very often. Most times people will be looking down at the hull from the dock, or from very far away as I do a horizon job – yeah right… But, I do like making sure any gouges or rough spots have been fared. The paint can’t look any better than what it’s being applied to, so I took my time. I made sure to wipe down the hull with the two rag method. Wiping the de-waxer on with one rag and removing the remaining liquid with a clean rag. I tried, best as I could to be sure the hull was free of wax so I wouldn’t have any fish eyes caused by wax particles overcoming the surface tension of the paint. One problem was the name STARFIRE was pretty thickly painted on both sides. I realized at the point of starting to sand that the hull had been painted before. I used 320 grit wet/dry sandpaper to carefully remove the name without going through the paint on the hull. I took a bit of a risk by assuming that the white hull paint was so hard that it had to be a two part polyurethane. I could have been wrong, and by all accounts, I would have a mess on my hands because a two part paint will not work over a one part. I could have tested a small area as advised by Jamestown, but I just went with my gut, and luckily I was right. After bringing the boat into a shop I was able to sand the hull with 220 grit paper on an orbital sander. I wiped down the hull with mineral spirits using the two rag method. At that point I masked off the waterline, toe rail, and a few thru-hull fittings on the transom. Just after I mixed the paint I tack clothed the entire hull carefully. I read that the paint should be thinned 8-10% depending on the temperature. I thought the shop was running a bit cool hovering at 60 degrees. I went with a little less thinning at 7%. I reviewed my math several times to be sure I had the right amount. I used a medicine cup from children’s Motrin that we seem to use a lot of at our house. The medicine cup held up to the Interlux Interthane 2333N reducing solvent with no problem. I mixed the paint and waited the required 20 minutes to allow the paint to make its magical molecular bonds. My dad would lay down about 2 feet of paint ahead of me and I worked the paint with horizontal brush strokes to flatten out the tiny bubbles from the roller. The hardest part was working the paint into the masked area where the hull met the toe rail. The roller couldn’t wet this one inch wide area because the toe rail sticks over the hull. With upward strokes at a 45 degree angle I was able to pull paint to the dry strip and evenly spread the paint. The last stroke I made was a vertical brush stroke from the rail to the boot stripe. This really smoothed out any brush lines and reduced any chance of paint sag do to a thick wet horizontal line of paint. At times we needed to move the scaffold and the wetted edge would dry a bit. My dad rolled over the dry edge with the last pass of the roller by about a roller width. I would not attempt to do any horizontal strokes, instead I pulled the paint down from the top and didn’t see any demarcation between where we started or left off. This really seemed to be the best way to transition from a dry line to a wet line in both the first and second coats. After we had finished the first coat I could see faint areas where the white paint ghosted through. It took almost all of the first quart to coat the hull. The color from Interlux (Flag Blue) covered very well. One coat would never have passed as a final coat, but it was pretty dramatic at covering. The next day I was able to sand out any little runs with 300 grit paper. I hit the hull with a light sanding using 220 and tack clothed. With the techniques and practice from the day before, my dad and I had a rhythm that worked well. The second coat went on really well, and we had no runs to contend with. And then, the pleasurable moment of removing the masking tape and paper while the paint was still soft – always a thrill. I am completely happy with the results. I would also consider mixing smaller batches of color to paint smaller dinghy sailboat hulls. I have an old beige Sunfish that could really get a great paint job from rolling and tipping Perfection. This boat has a great race record from near the Boston. 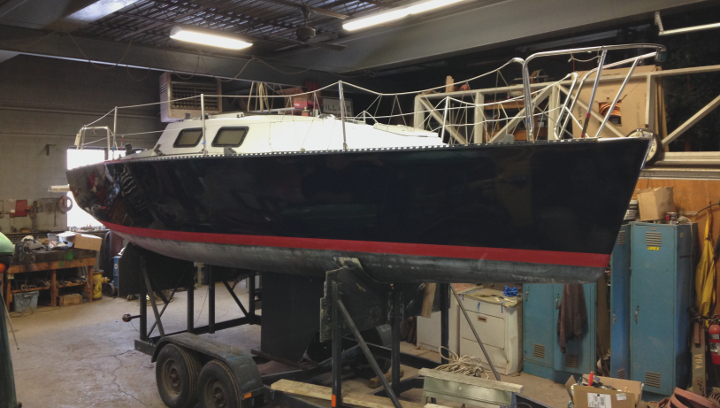 It was purchased by a father and son near us at Point Breeze, New York to sail at the Oak Orchard Yacht Club. Disaster stuck when a tree limb fell on the boat during storage. The mast was broken in to two, but it saved the cabin and rest of the boat from any real damage. The boat was a deemed a total loss and was subsequently donated to Oak Orchard Yacht Club. If the club could fix the mast it would be a loner boat for people to sail. The boat sat idle for over two years. The club was not interested in having a project boat sitting on their property and the boat was offered for free to my father, and then I came along. I was very excited to get an Evelyn 26 sailboat at the end of summer 2013. The boat has nice lines, but I really couldn’t warm up to the large stripe running partway down its hull. Although, once I removed the stripe the hull looked very nice, I though going for navy blue would make the boat look sleeker. Next project: I need to repaint the boot stripe and add a matching red cove stripe.